Fly Fishing for wild Steelhead at its best! Suskeena Lodge on the Sustut River is truly a jewel that is largely unknown except among a core group of fanatics that fish the river annually as they try to crack the 30-pound mark for wild steelhead. This is the remotest of all the famous Skeena tributaries meaning that guests visiting Suskeena Lodge will enjoy peace and solitude as they pursue the fish of a lifetime on legendary waters. 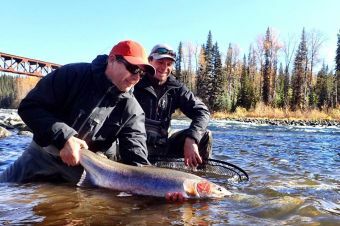 The 100% wild strain of steelhead entering the Sustut are among the largest in the world and only compare to those of its neighbors in the Babine and Kispiox rivers to the South. 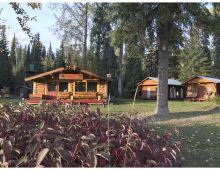 Accessible only by aircraft, Suskeena Lodge in Northern British Columbia boasts a beautiful remote setting with world-class wilderness accommodations accentuated by food and hospitality that are second to none. The capacity of the lodge is limited to 9 anglers during prime weeks enabling each angler to enjoy equal opportunity at every section of the river. Guests can expect to fish virgin water every single day of the trip! Our season begins in late August as the first aggressive fish enter the river in gin clear water and runs until the end of October when the fish are holding in numbers as they await their winter dormancy. The early season is magical with sunny skies and warm water. Dry-fly fishing can be the go-to method this time of year and can be off the charts. By October the leaves have dropped and cold nights and sunny days are the norm. This is the time of year when numbers of steelhead stack up in the river and provide excellent visuals and some incredible days of fishing. For a glimpse of what you can expect on your stay take a look at Keith Brauneis’ Video and let your dreams take you to this far-off place!